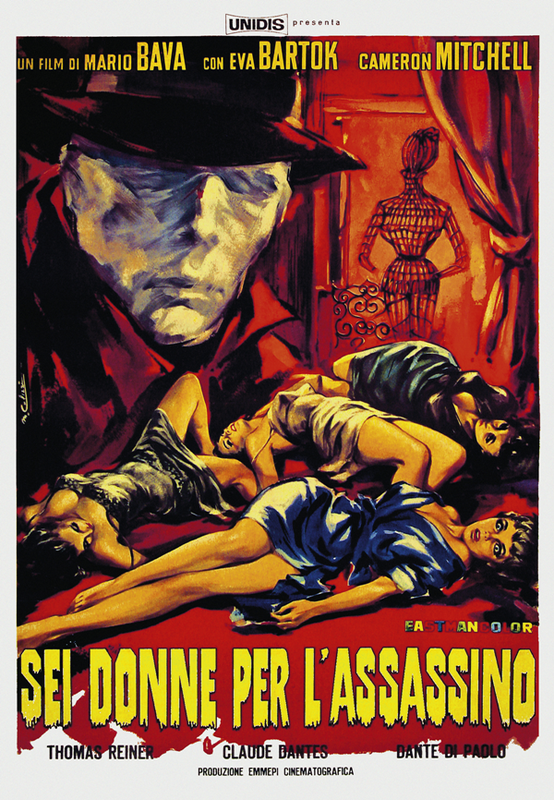 For today's GIALLOWEEN selection...I present the beautiful 1964 Mario Bava film...Blood and Black Lace. There isn't too much more that I can say about this film that probably already has been said countless times before. Mario Bava was a genuine genius. The kind of auteur that learned his craft early and applied some of that knowledge into his unique vision, which is something not too common these days. He studied and honed his craft with some of the greats before him...and used those technical skills to his own work. Bava has also been known to use some ingenious tricks to his films...in particular, a impressive shot in Blood and Black Lace where he substitutes expensive dolly camera work...with a kid's red wagon. Cameron Mitchell also noted that Bava had a "see-saw" camera contraption made in place of crazy expensive cranes in order to achieve certain overhead shots. The man was not only a genius...but, he was a technical wizard, thanks to his time working with experienced filmmakers earlier in his career. The maestro later taught his son Lamberto the tricks of the trade...thus giving the world another talented filmmaker to continue his legacy. When you think of careers that start and end in the genre...few are as diverse and colorful as Bava's was. One could easily tell that the man lived through his films and created, not only cinematic experiences with each and every one of his movies...but, he also made art. The kind of art that continues to inspire even today. Blood and Black Lace is a perfect example of that inspirational art. The film concerns a fashion house with a killer on the loose. That's pretty much it. However, how that basic premise is handled is what makes the experience so rich and so full of life. It is a film that has pretty much created the blueprint for subsequent gialli to follow. Mr. Bava was well ahead of his time when he made Blood and Black Lace as he concentrated on the kill scenes, making them unique and ornate. While previous films before emphasized on a rather rudimentary depiction of murder, Bava used never-before-seen elements in his scenes...dressing up each kill with color and unique murder weapons. This killer wore black leather gloves, a long black trench coat complete with a stylish fedora and a greyish/white hosiery over the head to disguise the facial features. Such a simplistic approach to a multi-leveled look...especially considering the twist reveal at the end. I watched the film for the first time in my life on the big screen this past weekend and it was more beautiful than I had ever imagined it looking in a movie theater. All the colors bled through the screen and that booming soundtrack stunned the audience into submission. Such an intoxicating experience that truly satisfied the entire viewing crowd on hand for the event. I was so happy to see the film have such an effect...even after over 50 years since its release. I often feel that in the modern landscape of genre film...nothing takes its time anymore. Especially when given the advances of technology. I love a good film that perfectly paces its storytelling and flaunts its beauty through cinematography and music. Anyway...watching Blood and Black Lace on a computer screen DOES NOT compare to watching it on the big screen...as it was meant to be experienced. However, if you have never seen the film...at least this YouTube video is better than nothing. Because, if you've never experienced this film before...then you are missing out bigtime, my friend. Best to rectify that post haste.